Gov. and First Lady Holcomb pose for a group photo with representatives from The Last Mile Program, the Indiana Department of Corrections and the women who will participate in the inaugural coding class at the Indiana Women’s Prison. Members of Indiana’s inaugural class of The Last Mile coding program enjoy a conversation with MC Hammer, who is a board member for The Last Mile. 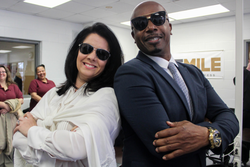 First Lady Janet Holcomb hangs out with MC Hammer at a ribbon cutting event for the launch of The Last Mile program at the Indiana Women’s Prison. 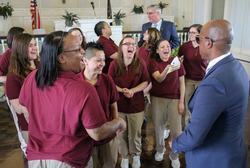 (INDIANAPOLIS) - Thursday at the Indiana Women's Prison, Gov. Eric J. Holcomb and First Lady Janet Holcomb participated in a ribbon cutting to mark the start of a new program called The Last Mile, which will teach a class of women offenders at the facility valuable coding skills they can use in the working world upon release. 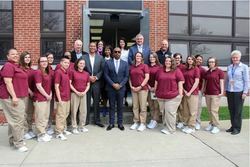 The Holcombs were joined by Indiana Department of Corrections Commissioner Rob Carter, The Last Mile Program founders, The Last Mile Board Member MC Hammer and 14 members of the inaugural coding class. "This is one of those days when I am bursting with pride to be Indiana's governor," Gov. Holcomb said. "The Last Mile program is a great example of what we can do when the public and private sectors work together to take Indiana to the next level, and I cannot wait to be back here when these ladies graduate--with valuable skills and ready to begin the first mile of their new journeys upon reentering society." The Last Mile program is currently operating in five correctional facilities in California--a state that claims 10 percent of the entire incarcerated population of the United States. There, 100 percent of graduates of The Last Mile secure employment upon release--with a 0 percent recidivism rate. Currently the Indiana's correctional facilities house about 27,000 offenders in 23 state prisons--and more than 90 percent of them will eventually be released back into Hoosier communities. Among formerly incarcerated adults in Indiana facilities, there is a 37 percent recidivism rate in the first three years after being released.